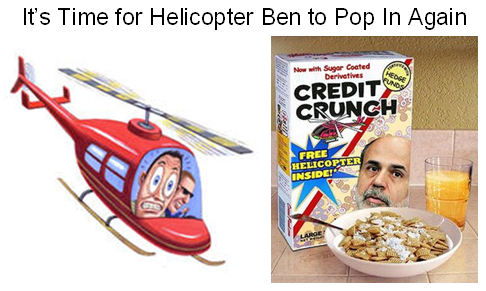 Ian Woodward's Investing Blog » Helicopter Ben to Pop In Again! Helicopter Ben to Pop In Again! It’s again that time of the month when everything stops for a visit from Helicopter Ben. In my opinion, it is not a coincidence that today was a jittery day for the leading stocks fat with profits that got hammered from head to toe. We shall see what tomorrow brings, but be rest assured that although the Fed’s action may at most produce another 25 basis points reduction in the Fed rate (and many feel they might not do anything), it will be the words that will speak louder than the actions this time. At long last Inflation, the Price of Oil and Food and the slide of the Dollar are of more concern, in my opinion. Meanwhile, back at the ranch, the VIX has laid dormant for all of 20 trading days and for the first time poked its %B head above the Bandwidth today…a sign that could lead to the Bear’s dancing once again. What will it take for the VIX Bear followers to do cartwheels that their patience has been rewarded? My crystal ball says an immediate bounce of the VIX from 20.24 to 21.56 will do the trick and that too will depend on what the Fed has to say tomorrow. 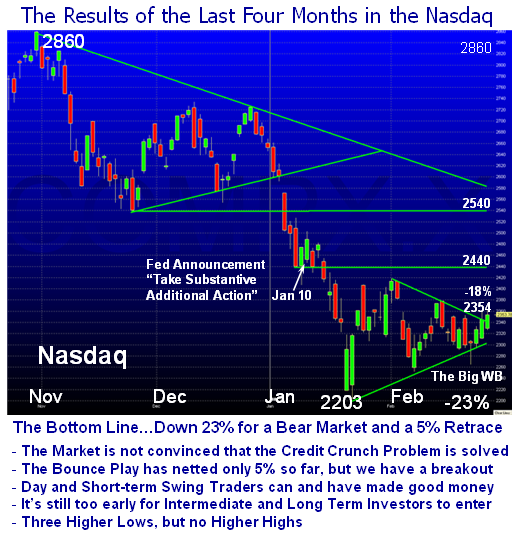 Otherwise anything below a reading of 20.00 will suggest more ambling sideways with a dormant VIX, and there may be hope for the Bulls to continue upwards. 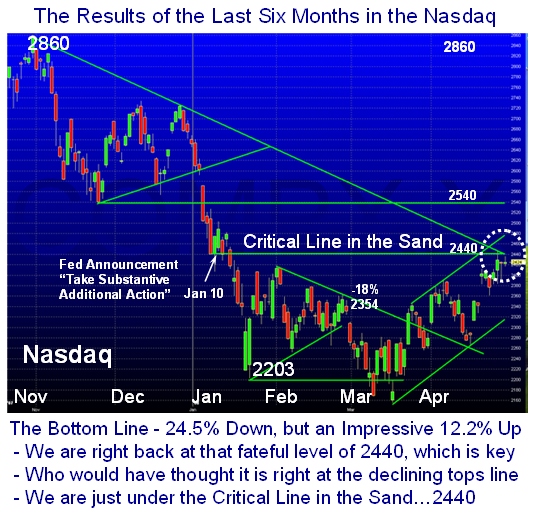 In summary, we have a confluence of forces at this point in time between the Line in the Sand at 2440 on the Nasdaq, the Rotation vs Correction discussion, the VIX laying quiet, the Earnings Reports, all waiting for a nudge as to which way for the Market Indexes to go. That nudge will likely come from Helicopter Ben popping in on us tomorrow. This entry was posted on Tuesday, April 29th, 2008 at 4:18 pm	and is filed under HGS Principles, Market Analysis. You can follow any responses to this entry through the RSS 2.0 feed. Both comments and pings are currently closed.